An EXCELLENT visual resource to see a Fresco Artist at work is Irving Stone’s “The Agony and the Ecstasy”, starring Charlton Heston and Rex Harrison. This movie was filmed in 1965 and tells the story of Michelangelo painting the Sistine Chapel. The video begins with a short documentary, which tells about Michelangelo and shows many of his great sculptural masterpieces, as well as scenes of the actual Sistine Chapel. Recommended short selections from the movie include those in which Michelangelo’s assistants are spreading plaster on the ceiling, perforating the paper “cartoons” and “pouncing” over this with a charcoal filled cloth pouncing bag. The movie has scenes of Michelangelo removing the paper fresco cartoon and revealing the black charcoal outline beneath. There are also scenes of Michelangelo (Charlton Heston) lying on his back on top of the scaffolding, painting the Sistine Chapel ceiling. The large face of the Delphic Sibyl (paintings needed to be large enough to see detail from the floor) is shown in close-up, as well as other sections of the ceiling painting. The movie is very long (139 minutes). It is not recommended to show the class more than one or two scenes. Teachers can project the video on the classroom screen if you discuss this with them ahead of time. If volunteers get the chance to view movie in its entirety, it may give a better understanding of just how much work and sacrifice the Sistine Chapel ceiling required of Michelangelo. The Fresco examples in this packet are both ancient and contemporary, from ancient Rome (Pompeii), early to late Renaissance Italy, 13th century China and 20th century Mexico. Using a globe or map is recommended since the examples are from such a variety of geographic locations. Information is included (at the end of the packet information) about the damages modern day pollution has caused many fresco paintings that have survived for hundreds of years. There are also some challenge worksheets to hand out as EXTRA CREDIT for older kids if you or the teacher is interested. Be sure ALL 8 pictures and Video are returned to the Packet Carrier after your Presentation is finished. 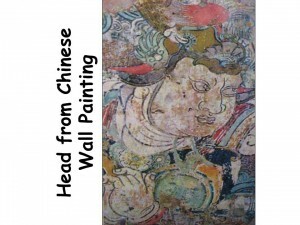 The beginnings of wall painting in China are unknown and ancient. This is the head of one of the guardian Kings of Buddhism. 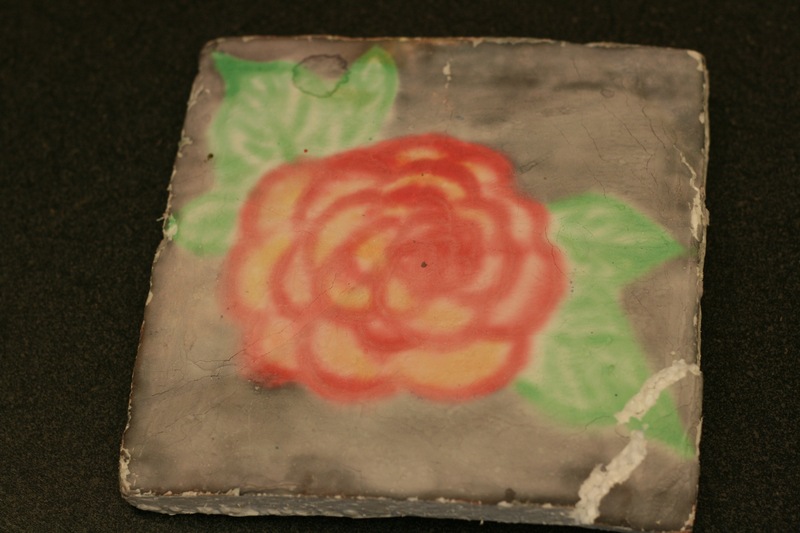 It’s part of a large fresco from an ancient temple in Shansi Province. 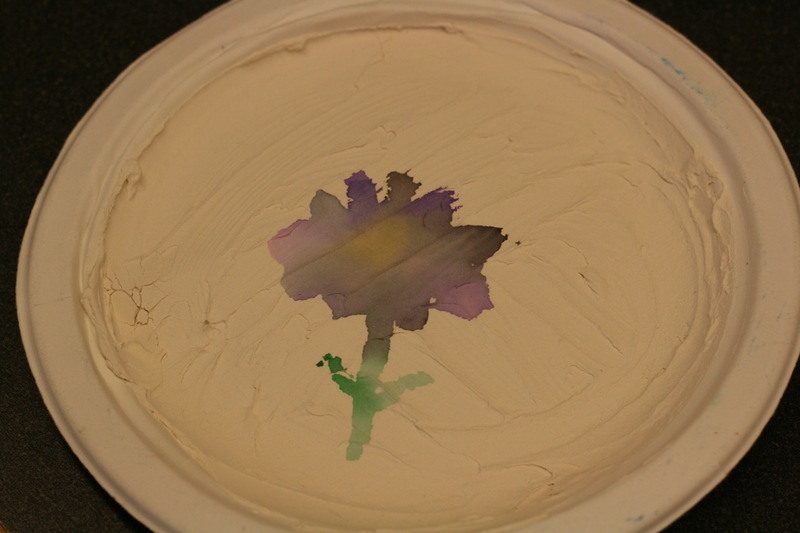 It was created with tempera paint on mud and sand. There are many LINES in this painting. Do you see more CURVED or STRAIGHT LINES? Curved—the use of so many curved lines makes this guardian king appear very chubby, a sign of prosperity in ancient China. His clothing and headpiece are highly ornate. 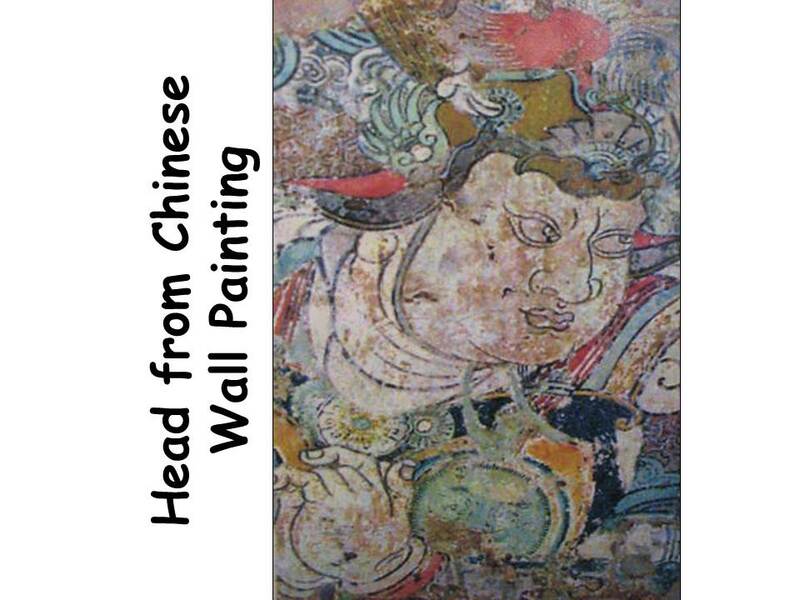 The king’s headpiece at first gives him a female appearance, until we learn more facts behind the painting. What type of PATTERN is used in the decoration? Notice that the king is darkly outlined. A more correct description for outline in an artwork is CONTOUR LINE. The LINES give the portrait an appearance similar to a painted coloring book because they show up well and are supposed to be part of the picture. 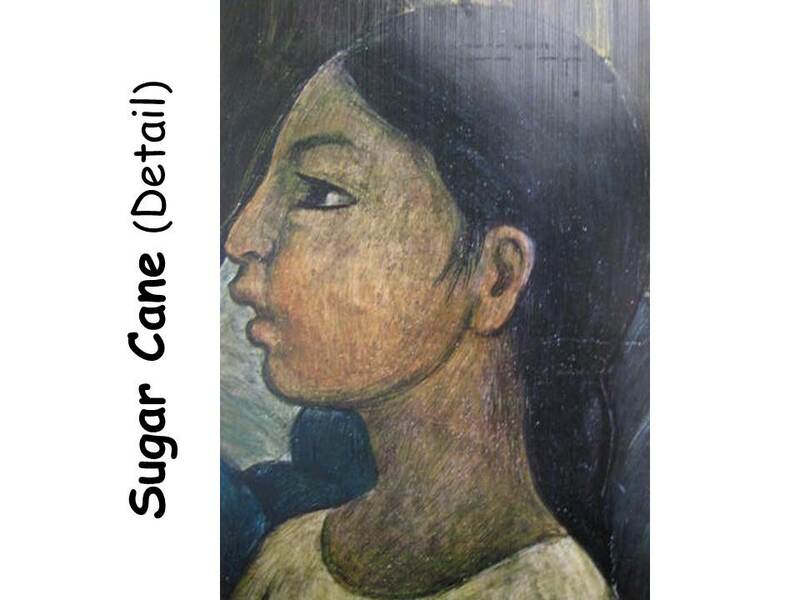 Traditional Oriental (or Asian) art includes dark CONTOUR LINE (outlines) in paintings, which makes this Eastern art different from European (Western) art. In most Western portraiture, the artist’s aim is authentic realism, like what is seen in a mirror or a photograph. The shaded edges of an object are carefully blended so you do not see a definite CONTOUR LINE. In Oriental art, CONTOUR LINES help objects stand out in a painting and these lines are never considered to create a “less lifelike” appearance in painting. What is happening in the picture? Who might the person behind the woman’s chair be? Is this picture very lifelike (Realistic)? Why or why not? The picture was painted almost 2,000 years ago. Notice the jewelry the woman wears. Do women wear anything similar today? Do you find it interesting how similar people of today look compared to these people of the ancient past? Because the ash from Mt. Vesuvius completely covered Pompeii, the city was lost for hundreds of years. Later people built over the top of Pompeii without knowing it. Fortunately, the ash preserved the Frescoed wall paintings very well. With careful archeological techniques, these important paintings were saved and now give modern people a more true and detailed understanding of ancient Romans. 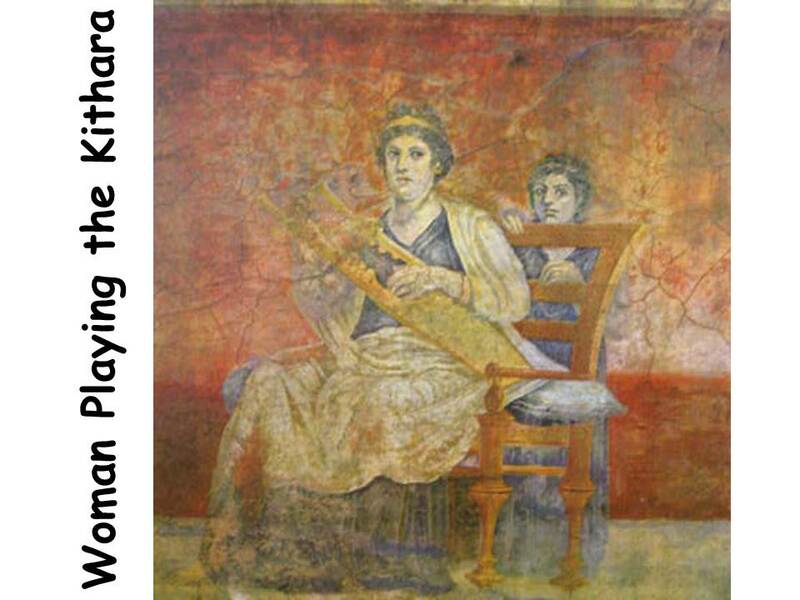 The frescoes of Pompeii, painted before AD 79, show the modern world many details about the lives of ancient Roman people—their clothing, jewelry, furniture, hair styles, personality traits, etc. A young Italian man painted this fresco about 64 years before Columbus discovered America. 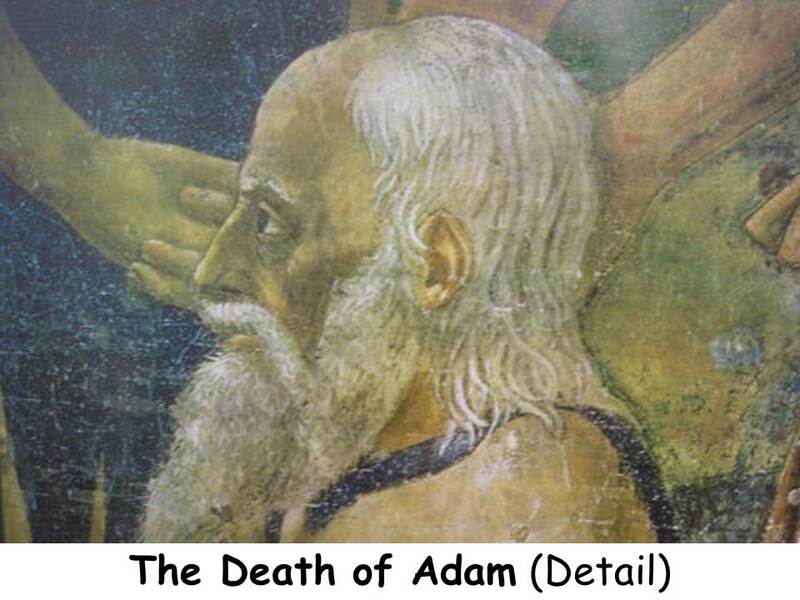 His name was Tommaso (toe MAH soe) Masaccio (mah ZAHT cho) and he lived only 28 years. In his short lifetime, Masaccio gave to the art world some wonderful frescos to study and learn from. During the early 15th century when Masaccio lived, artists didn’t paint people as realistic individuals. Painted figures looked very similar, were stiffly posed and artists didn’t worry much about lifelike body details (like muscles or correct proportions). However, Masaccio’s portraits are very lifelike, with correct body proportions and musculature. Masaccio was able to paint convincingly realistic portraits before most other artists of his time. This fresco tells a story from the Bible’s New Testament. It is about something that happened to Jesus and his helpers, the Apostles, during their travel to the city of Capernaum. There are three parts to the story and the parts are all painted together on the same wall, in a way that looks a little strange today. Follow along with me as I tell the story and point out various sections of this unusual picture. Why do you think the artist chose this dark blue for the garments of these two men? They are the main characters of the story. 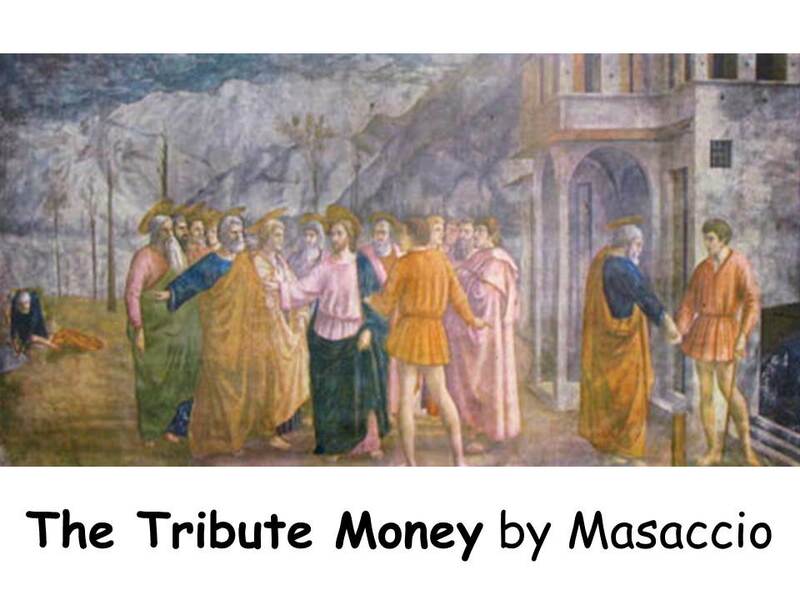 Masaccio has also skillfully used COLOR to create MOVEMENT, to carry our eyes through the story of the picture. The dark blue stands out more than any other COLOR in the painting. At first, our eyes notice the figure of Jesus. His pointing hand leads our eyes to Peter. Our eyes are stopped for a moment by the blue of Peter’s robe, which is the same as Jesus’ cloak. Peter wears a gold cloak over his blue robe and his right hand is pointing in the same direction as Jesus’ hand, towards the sea on the left side of the picture. The tax collector from Capernaum is the man with his back to us, in the orange tunic. (Men did not dress this way in the time of this story. 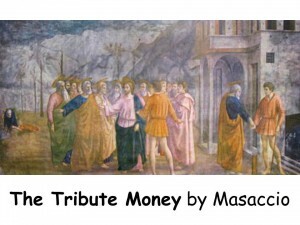 Masaccio has dressed the tax collector the way people dressed in Italy during the artist’s time.) 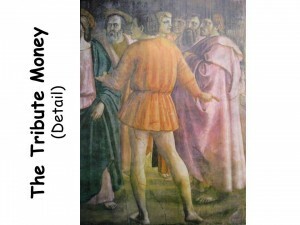 The tax collector has stopped Jesus and is demanding money as a tax for entering the city. In the story, Jesus doesn’t have any money but instructs Peter to go to the sea (where Jesus and Peter are pointing) and catch a fish. Jesus tells Peter to open the mouth of the fish and there he will find a coin. Peter is told to take the coin and pay the tax collector. How many times is Peter painted in the picture? Three times How many times is the tax collector painted in the picture? Twice, which makes the picture seem strange—it needs to be studied to understand the story. A “Detail” is a close up view of a part of a painting. This detail shows a close up of the tax collector from Capernaum. To his left, we see part of Jesus’ robe and his hand. Notice how realistically the muscles of his legs are shaped. 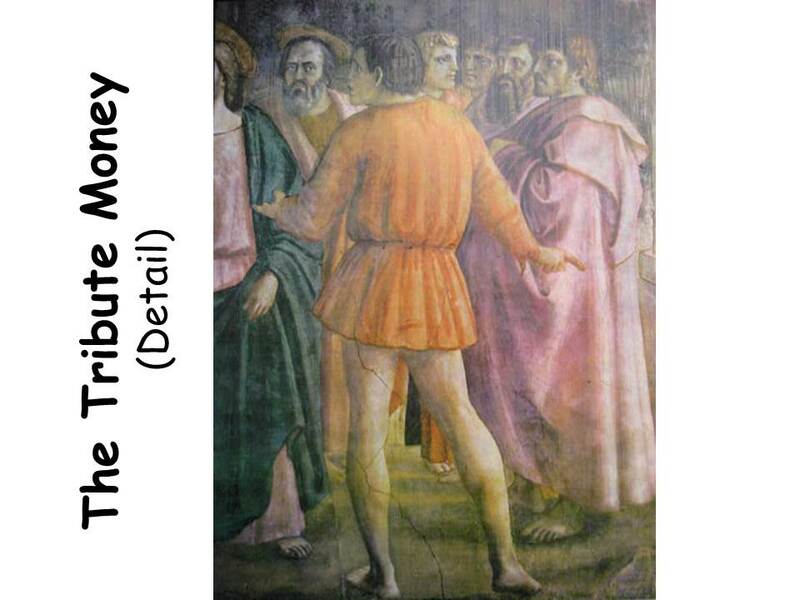 It was unusual to paint people so anatomically correct in Masaccio’s time. Is the fresco ruined because it has cracks? 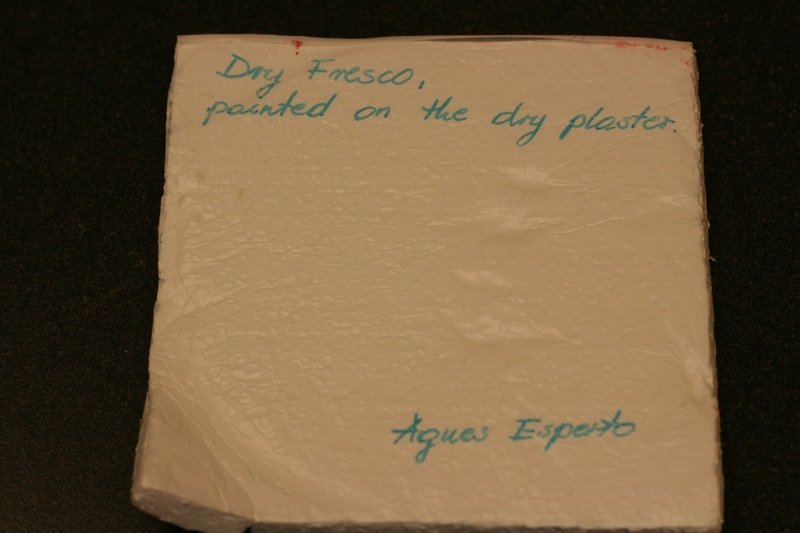 No, fresco is attached to the wall of a building that shifts and moves. Even fairly fresh fresco can develop cracks. The cracks give the painting character and interest. This painting is hundreds of years old, yet it is still easy to see the story. Leonardo da Vinci was born in the little town of Vinci, near Florence, Italy, in 1452. He was raised by his grandfather and lived during the fifteenth century, a period of European history, called the High Renaissance. At thirteen, Leonardo became an apprentice to a famous painter and sculptor. He worked with Verrocchio for several years. By the age of 25, he was famous as both a painter and a man of science. In 1517, King Francois I, of France, invited Leonardo to Amboise. There he lived in the small Chateau of Cloux, enjoying great honor and the esteem of the king and court. He died there in 1519. This picture is a Fresco. It is considered Leonardo’s greatest work and was done for the wall of a dining room that was used by the monks at the Church of Santa Maria delle Grazie, in Milan. Parts of The Last Supper were hard to see because the paint has been chipping off. 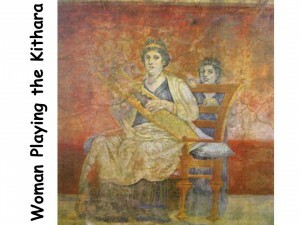 The fresco began to deteriorate only a few years after it was completed. Leonardo experimented with an oil tempera paint that didn’t adhere well to the wall. Over the years, many people have tried to repair the painting but the repair work actually ended up damaging the painting. A major renovation has restored this great work recently. In the center FOREGROUND, in the front of the tablecloth, Napoleon Bonaparte cut a doorway into the wall. Can you find the top of this doorway? He and his men made shelter in the monastery during an invasion of Milano. Napoleon’s headquarters were in the dining room and behind the wall of this fresco, Napoleon and his soldiers kept their horses. For convenience, Napoleon had a hole cut through the priceless painting and a door installed. During World War II, most of this building was bombed and destroyed. 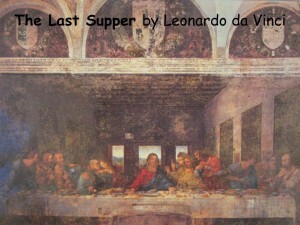 One of the few complete and standing walls was the one on which The Last Supper was painted. The locals covered the wall with heavy canvas, hoping to protect and preserve this historically important fresco. After the war, the fresco survived and the building was repaired around it. This picture is an example of Formal Balance or SYMMETRICAL BALANCE. If we were to fold this picture in half, we would see that the room is exactly the same on both sides. The walls are the same except that there is the shadow on the left side of the picture. Even the ceiling is symmetrical; it can be divided exactly in half and is the same on each side. In the center of the picture, Jesus sits in front of the middle window. The glow of the horizon behind Him creates a halo around His head. There is a smaller window on each side of the center one. Jesus is also sitting in the center of the table. The picture shows Him sitting with his closest friends, the twelve apostles. Although each of the apostles is arranged in a different pose, they are equally placed in the picture (six on each side). The special way Leonardo placed the men gives them a feeling of MOVEMENT that had not been seen before. 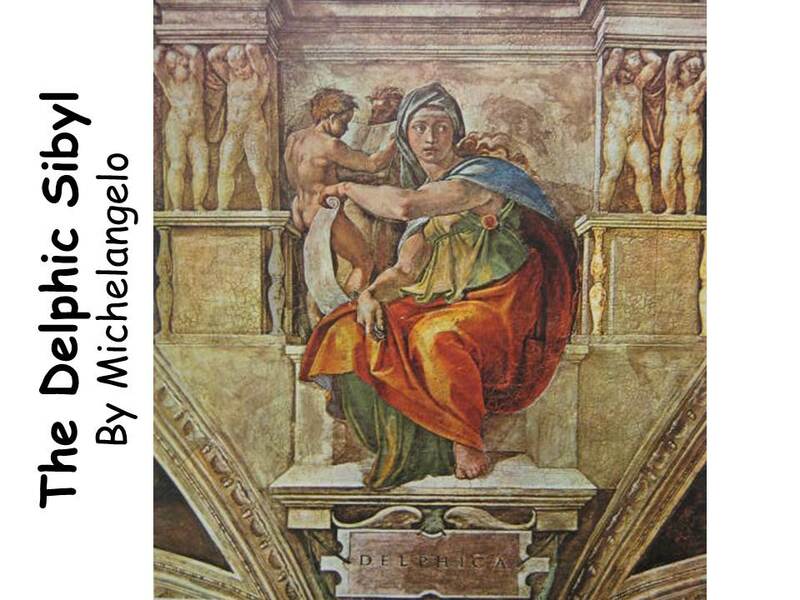 Michelangelo was born in Caprese, in Tuscany, Italy, on March 6, 1475. He attended Latin School and then studied painting and sculpture. The talented Michelangelo had attracted the attention of Lorenzo de’ Medici, by the time he was 15, and was invited to join the scholars, writers and artists who often gathered at the Medici Palace. Michelangelo was gifted as a painter, a sculptor, an architect, an engineer and a poet, yet he preferred to be known as a sculptor. “Painting is not my profession,” he used to say. Michelangelo painted the Sistine Chapel ceiling from, 1508-1512, lying all alone on his back, at the top of scaffolding. The painting of the chapel is considered his greatest painting achievement and presents scenes of the Bible’s Old Testament. It begins with Adam receiving the spark of divine life from God. The Creation of Adam is the most famous and popular of the scenes on the ceiling, which measures 44’ x 130’. The ceiling contains some 300 figures (or people) in all. Around the outside edges of the ceiling design are male Prophets of the Bible and female Sibyls. A Prophet is someone divinely inspired to know about future events. In Greek and Roman mythology, a SIBYL was a female Prophet, usually divinely inspired and associated with a shrine, temple or city-state. There were Sibyls throughout the ancient world. Medieval monks adapted the Sibyls to Christianity, making them 12 in number (the same as the apostles) and giving each a separate prophecy about the coming of Jesus. 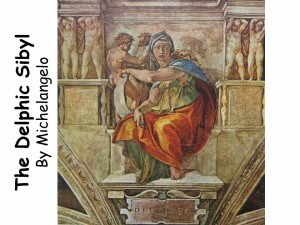 Michelangelo painted 7 Prophets and 5 Sibyls on the ceiling of the chapel. Behind this Sibyl’s shoulder, to our left, are painted two helpers. Most of the Prophets and Sibyls have two helpers like these. They are mysterious figures that experts believe may represent the thoughts of this Sibyl. Notice how the Sibyl seems to be reading a scroll and the helper behind her seems to be reading a book. On two platforms, on either side of the Sibyl, it looks like there are four children. These are supposed to be wingless angels, called cherubs. It’s easier to see the natural cracks of a fresco in this large poster. The cracks don’t ruin the look of the fresco. This fresco is hundreds of years old and cracks happen as a building shifts and moves over the years. This fresco picture is included in the Packet because you can see many of the black dots, created with the pounced charcoal, showing through where it has worn off top of the fresco. These dots outline many areas of Adam’s head. The cartoon was laid on top of the moist plaster, to help create the outline of the picture for the artist to follow. The black spots of charcoal were never supposed to show. The artist painted over these outlines. After hundreds of years, part of the fresco’s finish has been worn down, allowing us to see these outline marks. 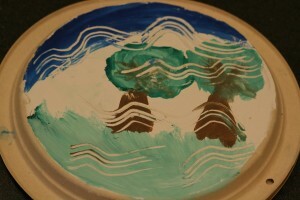 This close up view (detail) allows us a closer peek at a fresco artist’s design technique. 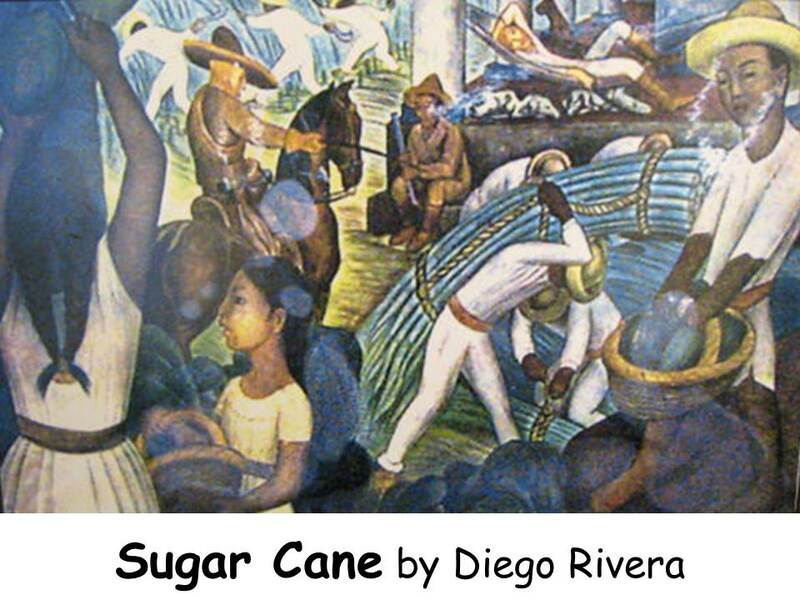 Diego Rivera is one of the most famous Mexican artists. He was born December 8, 1896, in Guanajuato (wah-nah-WHA-toe), Mexico. At the age of 10, Diego entered the Academy of San Carlos, where he enjoyed drawing and painting from plaster models. From 1907 to 1921, Diego traveled in Europe, studying the great frescoes in Italy and working in Spain and Paris. He knew the famous artists Picasso, Matisse and many others. In 1921, Diego returned home to Mexico and began painting murals showing the history of his Mexican nation. Diego Rivera was married to another famous Mexican artist named Frieda Kahlo. The two of them seemed to be opposites. Diego was a well-known and successful artist; Frieda was just beginning her career when they married, but eventually became famous. Diego was a very large man, over six feet tall and weighing 300 pounds; Frieda was only 98 pounds and five feet three inches tall. Diego dressed messy, in paint spattered overalls, a hat and boots; Frieda always wore pretty dresses, lots of jewelry and put flowers and jewelry in her long, dark hair. Their friends called them “the Elephant” and “the Dove”. Frieda playfully called Diego “Frog Face”. Diego was so large that he could not buy underwear to fit, so Frieda sewed him underwear out of bright pink cotton. 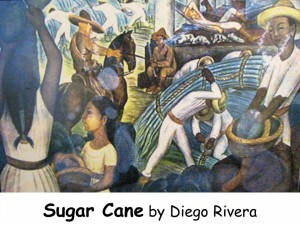 Diego Rivera decorated many of the public buildings in Mexico with Murals or Frescos. His Frescoes not only decorated the buildings, but also made political statements about the way of life in Mexico. The hot, dry climate in Mexico is perfect for *“True Fresco” art. This fresco shows Mexican peasants at work, harvesting sugar cane while their lazy, slave driving, employer lounges in a hammock. Notice the whip he holds in his hand. Does the whip make him seem like a “good guy” or a “bad guy”? Do you see any other “bad guys” in the painting? The man on the horse is pointing a whip at some of the workers. He doesn’t look very friendly. The man in front of him, sitting on the step, doesn’t look very nice, either. What kind of MOOD has the artist created in this picture? Although Rivera was making a statement about the working conditions of the Mexican general public, this picture comes off more decorative, as opposed to making any dramatic, political statement. This is because the workers look quite happy and healthy. Where do you see CURVED LINE? The sugar cane bundled together on the man’s back, the baskets and basket handles, the woman’s dress and belt in the left foreground, the hats, produce, horse reigns, etc. The artist has created REPETITION and RHTHM with the spacing of the three field workers in the far background. Can you see how they are dressed the same and are posed in a similar way? The artist has spaced them as if they are part of a pattern. What is happening in the BACKGROUND of the picture? What do you see in the FOREGROUND? Diego and Frieda lived in a studio outside Mexico City, which was actually two houses, connected with a bridge walkway between them. Diego lived in the pink house, and Frieda lived in the blue house. They would each go to their own houses, to work in their studios, during the day, and meet at night for late suppers of hot chocolate and sweet rolls. Diego believed that art could transform society and that murals were the best way for ordinary people to see art. He painted more than two and a half miles of murals in his lifetime. The first was a series of 124 panels illustrating the entire history of Mexico. It took Diego more than four years, working eight to fifteen hours at a time, to do all the painting by hand. Upon completing the work, he instantly became famous. His next great work was at the Agricultural College in Chapingo, Mexico, where Diego did murals in the chapel. The pictures were similar to Michelangelo’s Sistine Chapel Fresco paintings, but the people (or subjects) were Mexican Aztec people. During the 1930’s, Diego worked in the United States, painting Murals in San Francisco, New York and Detroit. In Detroit, he painted a Mural showing the history of the Detroit auto industry. Diego emphasized the human workforce, instead of the finished product, the automobile, and was criticized for being too sympathetic to the workers. *To create “True Fresco” the artist paints the wall while the plaster is still wet, so that the paint soaks into the plaster and actually becomes part of the plaster. The artist can only paint a small portion of the wall at one time and must find a place to stop that will not be noticed by having to match the exact COLOR. Where the artist stops will be the place to begin the next day. Very often cracks will form in the fresco, where the dry plaster from the day before and the wet plaster of the new day’s work have been joined. The beginning of a new day’s work took place around the contours of this girl’s head and shoulders. If we could view the original painting, this would be more noticeable. Look closely at the bottom of the back of the girl’s hair, where it touches her back. There is a joining crack there. There is also a crack starting at the tip of the girl’s nose, following up the edge of her forehead and ending at her hairline. Fortunately, these joining cracks are not that easy to see in a fresco painting. You really must LOOK for them, to find one. Diego painted frescoes that showed things in the average Mexican worker’s life that he felt were unjust. He wanted people to be aware of problems, so people who cared enough and had the means could help fix them. Diego was even accused of being too sympathetic to American automobile workers in his Detroit, Michigan Fresco. Paint a picture showing something unjust that you have seen. Things like bullies on the playground, sick children in hospitals, animals hurt by humans, friends hurting your feelings, not being invited to a party, old people alone in nursing homes, homelessness. Try to create an idea in your picture that might help FIX the unjust thing you are illustrating.